Stephen O’Donnell believes Coleraine have ‘clicked’ in terms of implementing a new strategy under Rodney McAree. The Bannsiders were impressive as they ran out 2-1 winners at Linfield last Saturday. And the Showgrounds skipper the changes made since McAree arrived at the club are now bearing fruit. “To be honest, I think it took the squad a couple of weeks to implement some of the changes Rod has wanted us to make,” said O’Donnell. “I know he spoke and said maybe he tried to have a few allowances at the start based on how we had done, but I think he has made the right decision in changing it and putting his stamp on the team. “I think over the last four weeks in particular, the boys have really picked it up and gone with it. “I think the Crues game was a good performance, the boys were unlucky away at Glentoran and we should have got a result against Cliftonville. “We came out on Saturday and it seemed like it has finally clicked in the sense of with and without the ball and long may it continue. “It was a massive three points for us against the Blues. “Rodney said to us that it was our most important game of the season in terms of ‘do we want to kick on and go and try do something this season or do we continue to be patchy and inconsistent’ and for us we have put back-to-back wins together for the first time under Rodney. The Bannsiders opened up a six point gap on Glentoran following their win at Windsor, but O’Donnell knows the Glens will be up for the battle on Saturday. “I think they have improved from last season and you have to give them credit for that,” he said. “They aren’t playing like the bottom six side they were last season and they are looking to finish in the top half. “We went up there earlier in the season and we should have won that game and we didn’t. “Again we should have won the cup game a few weeks ago but we didn’t. The Bannsiders welcome a familiar face back to The Showgrounds this Saturday. 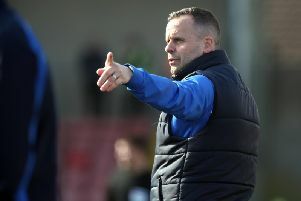 Curtis Allen was one of Oran Kearney’s first signings when he took over the reins at Coleraine in 2011. He went on to score 45 goals during his two-year spell on the Ballycastle Road. And Allen admits the Bannsiders will always have a special place in his heart. “Oran Kearney and Coleraine revived my career, because I was down in the dumps a bit,” said the front man who has racked up 100 goals at The Oval. “To go there and score 45 goals over two seasons and get a move to Inverness, I achieved my goal of trying to get back to full time football. “Some people might say I took a step back to take a step forward in terms of making the move to Coleraine, but Oran (Kearney) did great things there. After a bright start to the season the Glens have stuttered a bit in recent weeks. Three defeats on the bounce have made it a difficult November as they lost ground on the top six and also crashed out of the BetMcLean League Cup.